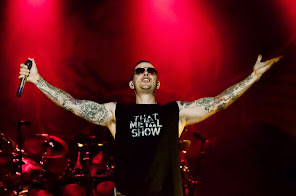 Avenged Sevenfold News: M.Shadows: "There’s actually a lot of guys I wouldn’t want to see..."
M.Shadows: "There’s actually a lot of guys I wouldn’t want to see..."
5. You have a dentist appointment, and your regular dentist can’t make it. When the chair spins around who do you NOT want to see there. One of our security guys, Big T. He’s like seven foot tall and nuts! There’s actually a lot of guys I wouldn’t want to see.